1 OWNER VEHICLE, BACK UP CAMERA, HEATED SEATS, BLUETOOTH, ALLOY WHEELS, AWD CARFAX One-Owner. 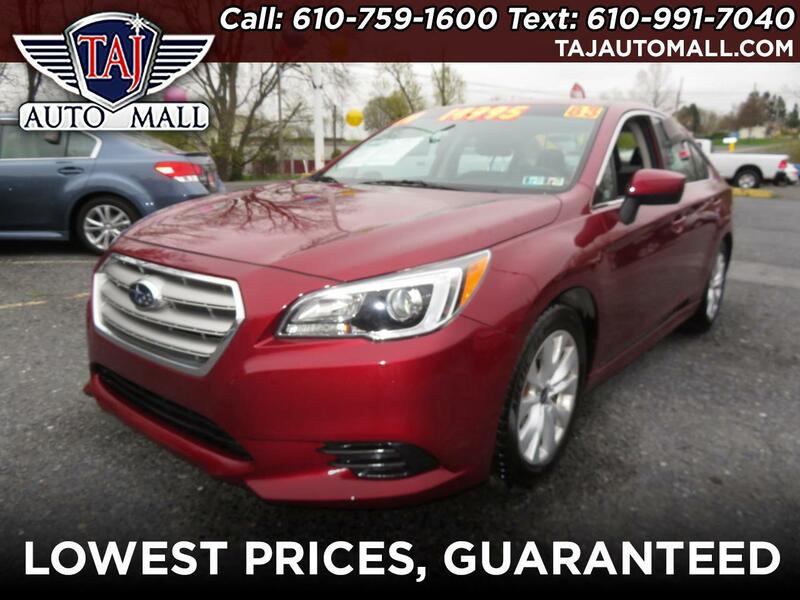 Red 2015 Subaru Legacy 2.5i Premium AWD 2.5L 4-Cylinder DOHC 16V Recent Arrival! 26/36 City/Highway MPG Awards: * 2015 KBB.com Best Resale Value Awards * 2015 KBB.com 10 Best All-Wheel-Drive Vehicles Under $25,000 * 2015 KBB.com 10 Best Sedans Under $25,000 * 2015 KBB.com 5-Year Cost to Own Awards * 2015 KBB.com Brand Image Awards Reviews: * If you live where it snows, the 2015 Subaru Legacy should be at the top of your midsize sedan shopping list. True, it's now not the only one to offer AWD, but it remains the best and the most affordable. Other positives are the Legacy's history of reliability and strong resale value. Source: KBB.com * Standard all-wheel drive; excellent outward visibility; spacious cabin; top crash test scores. Source: Edmunds * Introducing the all new 2015 Subaru Legacy. Legacy features completely revised and retuned steering and suspension, resulting in both improved handling and a quieter, more composed ride. Standard on all models Symmetrical All-Wheel Drive makes for better stability, efficiency, and a quicker response to road conditions. It is designed for optimal balance and an even distribution of power for maximum traction. The combination of the advanced SUBARU BOXER engine and a highly efficient Lineartronic CVT allows the Legacy to get up to 36 mpg hwy with the 2.5L engine. You can also opt for the potent 3.6L engine as well. Legacy's completely new and spacious interior features soft-touch high-quality materials throughout. Available features also include a 10-way adjustable driver's seat with 2-position memory, heated rear seats and rear A/C vents to bring front-seat comfort to the entire cabin. The available All-Weather Package includes heated seats, heated side mirrors, and a windshield wiper de-icer to improve both comfort and visibility. With EyeSight technology, two cameras above the rearview mirror of the Legacy can monitor traffic and react to conditions before you can. An alert will be sounded along with a visual warning when it senses danger of a collision. It can even apply the brakes automatically if you don't. EyeSight also optimizes cruise control and can warn drivers when they're swaying outside their lane. The new Subaru STARLINK infotainment system brings smartphone entertainment and communication to your dashboard, with an available 7-inch in-dash touch screen and voice controls as well as voice-activated GPS navigation. Also available is a 12-speaker, Harman Kardon 576-watt equivalent premium audio system. Source: The Manufacturer Summary Taj Auto Mall has over 1,500 affordable vehicles in stock. Our dealership specializes in providing you with the best used cars, trucks, and SUVs in the Allentown, Pennsylvania area. Part of our promise to you is that we will always strive to provide you with unbeatable service. Our goal is to go above and beyond your expectations. Our Bethlehem dealership has tons of well-equipped SUVs, trucks, and cars at highly affordable prices. Recent Arrival! So come on down to our dealership in Bethlehem, Pennsylvania. We are open Monday through Saturday from 9 am to 8 pm. Contact us with any used car questions you may have, our number is 610-759-1600. Make Taj Auto Mall your first choice for affordable used vehicles.